The hard shoulder will be opened to traffic from today on part of the second stretch of "smart motorway" through Rotherham. Highways England has been working on the £106m scheme on a ten mile stretch of the M1 between junctions 32 (south of Sheffield and Rotherham) and 35a (north of Sheffield and Rotherham). A 20 mile stretch of the M1 between junction 28 (South Normanton) and 31 (Aston) is also benefiting from a project costing £205m where four lane running began in April. 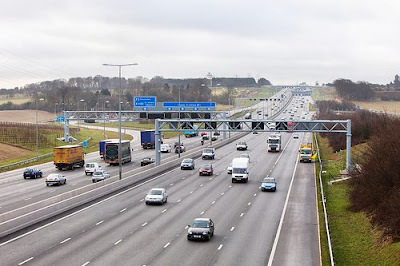 The projects include converting the hard shoulder to an extra traffic lane in both directions and variable mandatory speed limits and they deliver benefits at a significantly lower cost than conventional motorway widening, and with less impact on the environment during construction. The hard shoulder will be opened between junction 34 for Meadowhall and Rotherham and junction 35a for the A616 Stocksbridge bypass. Variable speed limits will be used to keep motorists moving with the overhead electronic signs used to help to prevent queuing and keep drivers informed about the journey ahead, and emergency refuge areas provide a safe place in case vehicles break down. Next week, speeds will be limited as the technology is calibrated. Andy Kirk senior project manager at Highways England, said: "We are investing a record £15 billion on improving our roads, making journeys easier, safer and quicker. "Smart motorways are a safe way to increase capacity on our roads and proven to cut journey times and wasted hours stuck in traffic. "This is a great milestone in the scheme, with more than 100,000 drivers a day benefitting from four lanes of road ahead of the smart motorway full opening next year." Roadworks and a speed restriction of 50mph will remain between junction 32 (for the M18) and junction 34 (for the Meadowhall and Rotherham) while work continues. The scheme which is 10.5 miles is expected to be completed next year. Environmental assessments carried out on the managed motorway schemes through the Sheffield city region showed there was likely to be an adverse impact on local air quality if the motorway continued to operate at the national speed limit (70mph). A proposed maximum mandatory 60mph speed limit was discounted by the Government and the latest option could see 60mph speed limits at weekday peak times between junctions 28 and 35a - between 07:00-09:00 in the morning and 15:00-18:00 in the evening. The Transport Committee of MPs has warned that the Government should not proceed with "all lane running" schemes while major safety concerns exist. However, Highways England has set out proposals for a project for four lane running on a stretch of the motorway between Rotherham and Wakefield which would ultimately help create a smart motorway all the way to Leeds. In the last budget, the Government confirmed that funding would be made available to accelerate an M1 smart motorway scheme from junction J35a to 39 which would cost around £100m.